Makoko is no ordinary neighbourhood of Lagos, Nigeria’s most populous city. Most houses in the slum dwelling rest on wooden stilts in the Lagos Lagoon, which is perhaps why some call it the “Venice of Africa.” But there’s a paradox at play: while Makoko thrives on water, residents here lack access to safe drinking water. Most of Lagos has perhaps never been to Makoko, especially not when it rains. It had been pouring on and off on a recent Sunday there. The rain spilled sewage and solid waste through the streets leaving behind a stench. Shops lining the flooded streets didn’t seem bothered by their environment and continued selling a range of items – from fish to teddy bears. There was commotion at a junction where the streets of Makoko meet the lagoon. At the water’s edge, a group of kids manned what looked like a taxi stand. Only, the taxis were spindle shaped wooden canoes that led passengers deeper into the heart of the shanty town. “Come, come!” the boys yelled. They paddled hard and competed for their canoes to be closest to the pier. The boats, approximately three to five meters in length, are quite unstable but are the only mode of transport available to most of Makoko’s residents. Back in the 18th century Makoko used to be a small fishing village before it grew into the sprawling 0.85 sq km urban settlement of today. There are no official census records but estimates suggest that the population here is anything between 30,000 to 250,000. Many of Makoko’s inhabitants are from neighbouring Benin and Togo – most of them live here since decades. An average of eight people live in each house, which sustains itself on fishing or collecting wood from the lagoon. 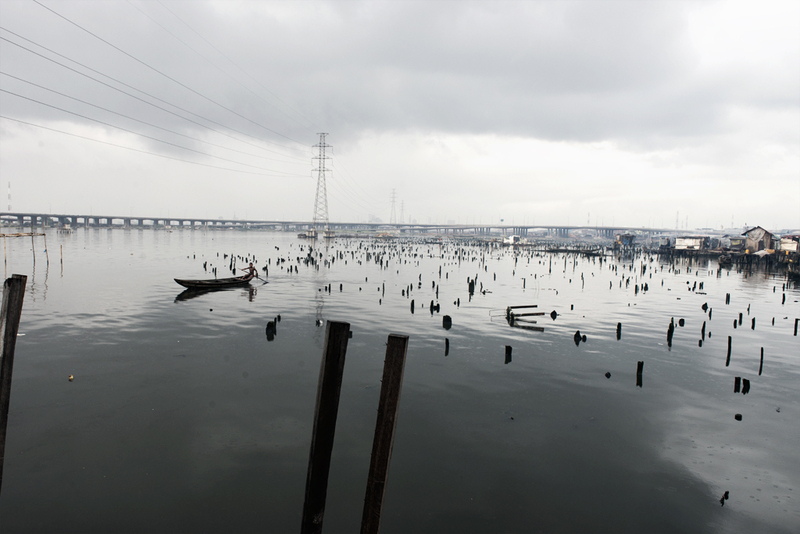 Makoko’s biggest challenge also involves water – it is polluted. Residents of Makoko therefore lack access to clean and safe drinking water. Benjamin Aide Moses and Gerald Frank Ogon are friends who were born and raised here. Benjamin Aide Moses said, “I grew up in Makoko. Day-to-day, water is a problem here.” Gerald Frank Ogon nodded along: “People have lived here for many years and there is no solution to the water problem. We have boreholes, where they sell water to the people.” Local entrepreneurs like Samuel Onoja dig out groundwater and sell it at different locations around Makoko. He fills up a large tank from a borehole 200 metres into the lagoon and sells it near his home. “I work for my boss. He buys the water for 2000 Naira (13$) and we sell it for 4000 Naira (26$),” he explained, as he rushed to fill his customers’ canisters who had queued up in boats outside his hut. It’s routine in Makoko for one family member to queue up at local water kiosks to fetch their daily supply of water. On an average, each family in Makoko spends around 5000 naira (31$ ) each month on groundwater. It’s not just unsafe drinking water that creates health complications, Dr Theophilus Damijida added. Makoko also lacks drainage and sanitation. Domestic sewage from the slums is let straight into the surroundings increasing the risk of infectious diseases among inhabitants. Only last week, there was an outbreak of cholera in the slums. 75% of the population should have got safe access to clean water but in 2012 44% of Nigerians still had no access to this basic commodity. Nigeria is one Africa’s leading economies – it’s GDP is second only to South Africa. The country has abundant natural resources like gold, oil and natural gas and diamonds. It’s economic growth, however, doesn’t seem to have the desired trickle down effect. Basic living standards like safe drinking water and sanitation are abysmal not only in Makoko but in various other regions across Nigeria. According to the NGO WaterAid, 63 million Nigerians lack access to safe drinking water and 111 million have no sanitation. In it’s country report, the NGO stated that local governments often lack funds to provide adequate infrastructure in time. Moreover, 97,000 children die every year in the country from diarrhoea caused by unsafe drinking water and poor sanitation. The Millennium Development Goals (MDG) aim is to provide 75 percent of the population with safe drinking water and 63 percent with basic sanitation by 2015. However, in 2012 only 56 percent had access to safe water and 31 percent to basic sanitation. Rapid urbanisation coupled with a growing population makes this more challenging for a city like Lagos. In the last 15 years, the city’s population has doubled to over 21 million residents. According to estimates, this number is likely to rise to 35 million by 2025. Although Ojikutu’s words sound encouraging, the government’s actions have not always been so. In July 2012, the city authorities left thousands of people homeless after an eviction in one neighbourhood of Makoko. Since the area is considered to be an illegal settlement they were given a 72-hour notice before their houses were destroyed. The government offered no rehabilitation or compensation to the people affected. In an ever-growing city, where many desire waterfront property, there are suspicions that the city wants the entire community gone. But there are many who call Makoko their home and want to stay there. A project that could be a starting point for change in attitude towards Makoko is a floating school. The project was designed by the Nigerian architect Kunlé Adejemi and supported by the Heinrich Böll foundation and the United Nations. Soon to be opened, the school will accommodate 100 students. The developers see it is a pilot project that addresses the community’s social and physical needs. They plan to develop the whole of Makoko into a floating community to deal with significant increases in sea levels and flooding. It’s uncertain whether their ambition will be realised, but the project brings optimism to those dealing with everyday problems in Makoko. Moreover, the Lagos state government has begun work, slowly but steadily, for a future city that should be able to provide up to 40 million people with a decent place to live.One thing that signifies people’s hope in future is a common Nigerian saying, “In Nigeria we don’t have problems, in Nigeria we only have challenges!”.